Sometimes life calls for easy meals. And sometimes, someone turns said easy meals into meals that require 2 bowls, one slow cooker, 3 sauce/sauté pans and three separate homemade components. Hi guys! I’m Nicole, and I have a problem. I overcomplicate everything. In life that’s always a problem, but with cooking, it oftentimes results in much tastier, more exciting food. So is it a problem?? I’ll let you decide. This overcomplicated meal came about after brainstorming menu ideas for a Bachelor In Paradise watch party I was hosting. And let’s just get the elephant on the page out of the way first, since I know you all are reading this with judging eyes. Yes, I get together with a bunch of ladies and we all watch Bachelor in Paradise together. No, we are not ashamed. Yes, we love every single dramatic second of it. While brainstorming for said party (that was also on a weeknight) I knew I needed to keep things simple, so what initially began as a humble spicy slow-cooker pork, that was to be nestled into store-bought Hawaiian buns, transpired into a quest to make the absolute perfect pork slider. It also didn’t help that a few days before I had these pork sliders at a favorite happy hour spot of mine, further enticing me to forgo boring store-bought buns and accompaniments. 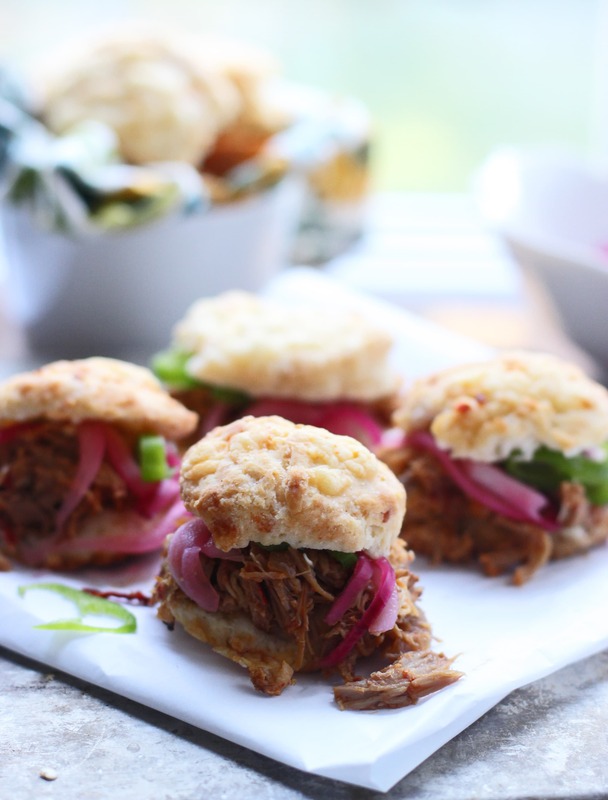 And so….Spicy pulled pork on Jalapeno Cheddar Biscuits with Pickled Jalapeno Red Onions was born. 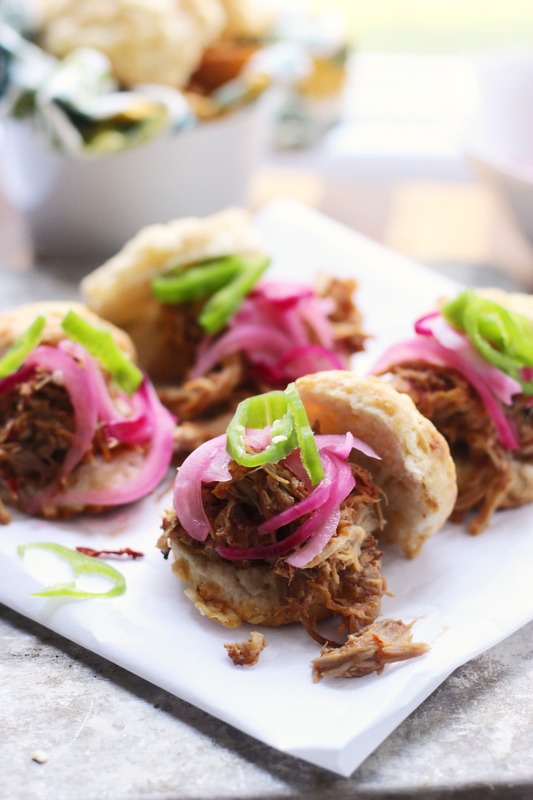 These easy pork sliders are spicy, sweet and savory all at the same time, perfect for fall, football parties or random get togethers and sure to not disappoint! Toast chilies in a large non-stick pan, until fragrant and slightly toasted. Fill pan with water and let soak until soft, about 10 minutes. Drain, seed and stem chilies. In a food processor or blender add chilies, along with chicken stock. Set aside. Season pork generously with salt and pepper. In a large, non-stick sauté pan, heat oil to a high heat. Sear the pork until all sides are crusty and golden brown. Transport to slow-cooker. Pour in orange juice and chicken stock mixture. Sprinkle with garlic and onions. Set the slow-cooker to low, and let cook until fork-tender, 6-8 hours. At this point I like to put it in the fridge overnight, so in the morning the fat can be easily skimmed off. If you don't want to wait, just skim as much fat off the top as possible. Remove pork from slow-cooker and shred meat, discarding any fat. Strain the liquid mixture through a strainer into a non-stick sauté pan. Add brown sugar, bring to a boil and reduce to a simmer until the mixture is slightly thickened, about 5-10 minutes. Add shredded pork back into the sauce. Season with cayenne pepper and salt if necessary. Place onions and jalapeño in a bowl. In a small saucepan, heat vinegar and sugar, until sugar is dissolved. Pour mixture over onions and jalapeño. Let set for at least one or hour or overnight. 12 Responses to "Tex-Mex Pulled Pork with Pickled Onions and Jalapeño Cheddar Biscuits"
Definitely add an extra mmmmmm element! Thanks Melanie! Foods are much more interesting when they have lots of components so I say complicate away! If you’re going to cook you might as well really go at it. I think these biscuits look perfect. Love the pickled onions! I did!! Ha! Thanks Todd! Haha. I hear you! I’m always making easy recipes a lot more complicated too! These little biscuit sliders look SO HEAVENLY though. I want one now! These sure do look pretty darn awesome – love that you served them on those biscuits! Haha, that sounds like so much fun! My husband and I have moved around a lot in the past few years and I really miss having a group of girlfriends to watch trashy tv shows with! Also, I think it is completely ok that you over complicated these because they look amazing! Pulled pork and pickled onions are one of the best combos ever!! I’m sorry, I don’t see a problem? 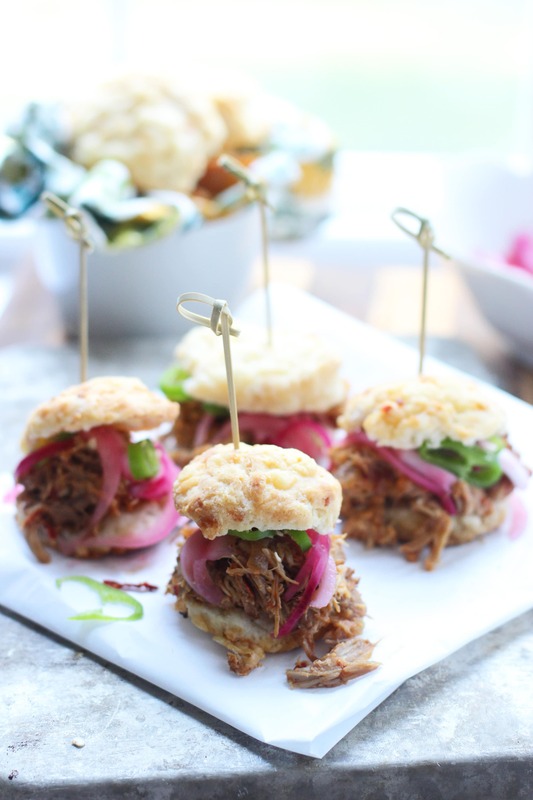 I see some gorgeous pulled pork sliders on some to-die-for biscuits that involve tons of cheese. These look outrageously good..definitely worth the complication!